I am an avid yarnie with kids, grankids, a really weird beagle, a turtle with a beef against dark colored rocks (don't ask), and about a half dozen marimo moss balls. I have many interests but few rate the level of obsession I have for yarn. I first learned to crochet in '92 from an Aunt and since then it's been a steady diet of yarn, hooks, patterns, learning to knit, more yarn, more needles, making my own patterns, spinning fiber, more yarn... well, you get the idea. Yarn has been my friend and therapy for over twenty years now. Hey - it's cheaper than Prozac! This entry was posted in Uncategorized on April 5, 2016 by jennyinstitches. Jane confirmed things I’d already discovered for myself about the wonders of crafting but I also learned new things too! So thank you Lena! For showing me this article. Thank you Jane! For presenting this and giving people even more reason to yarn. And a very large thank you to my Grandma and Aunt, for starting me on the yarn path. This entry was posted in Uncategorized on January 26, 2016 by jennyinstitches. Seems as good a time as any to work on another washcloth though. This one in crocheting in sort of a modified brick stitch. It’s going well, and super fast. At least until the dog decided I was done fiddling with yarn and sat on it. This entry was posted in Uncategorized on January 20, 2016 by jennyinstitches. Stay warm – Keep knitting! Okay by now the cold weather really isn’t news but I’ll just add my two cents… Holy Crap on a Cracker!! I know I’m not the only one yarning like crazy to keep warm. If I could figure out how to just wear the whole sheep I’d have done it by now. I am still working through my stash while commuting to various jobs. Today I am making progress on a cute scarf of French braid cables. 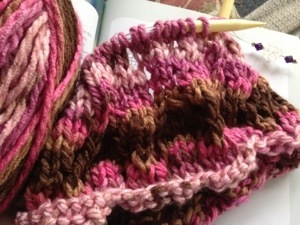 I love knitting up any kind of cable – they’re so much fun. One thing I have learned with them is keep track of your needles! I don’t like using the smaller cable-needles so I usually pull out an extra double point a size larger. But I have a habit of tucking it in my hair between rows and then forgetting it. Not a bad thing – until you try to put a hat on, or change clothes.. Ow. In Shop News: I’ve finally opened my Etsy store! This is huge for me not only because it involves putting myself out there (which includes some vulnerability) but also because I’m finally being more proactive. I’m easing into listings and doing a lot of reading, but lately it’s been very little action. So go me! It’s only up from here. Hope everyone stays safe and warm. And look for JennyInStitches on Etsy – I’d love to help build your network! This entry was posted in Uncategorized on January 23, 2014 by jennyinstitches. I hope all my US peeps had a great 4th of July and avoided much of the rain. It is still drizzling here and we’re back up to flood warnings. We got wet a few times at the festivities, between the parades, BBQ, and the fireworks but all in all had a good time. I woke up way too early this morning – I’ve actually been up for a couple hours now – with a monster headache. Not the good kind that can be blamed on too much beer. It’s just all the wet weather, I think. Everyone has some kind of sniffle or cough or sinus crap by now. Welcome to Ohio, right? But, head explosions or not, I’ve gotten myself out of bed and started the day. Quietly, because no one else seems to have the awake-at-6am problem I seem to come down with. Our dog of course is raring to go and I was half-way considering grabbing the umbrella and taking him out, until he finally noticed the rain and hit the brakes at the front door. Then he gives ME that look that says I’M the nutty one for wanting to go out. I’m ready to tackle today’s projects now. It will be a good day for cleaning up inside but that won’t start until the sleepyheads are up – sometime around the crack o’noon. Instead, I am catching up online and pawing through my stash for inspiration. I’ve finished the body of the infinity scarf I started last week but it’s not quite there yet. Scratch that, I hate that saying and I’ve somehow absorbed it from my job. Blech. ANYWAY. I know I want to put a twist in it before I seam up the ends. I am also going to add a sort of free-floating 3D element but I haven’t decided what yet. There is also the join itself, which will get some attention. As usual, I don’t really have a plan and I’m not following a pattern. I just listen to the yarn. For now I’m still stitching but I may be doing it in a lifeboat! This entry was posted in Uncategorized on July 5, 2013 by jennyinstitches. At 3 am we got the most hellacious storm. Just the rain would have woken me if I hadn’t been sleeping like crap anyway. No damage to speak of though, so all is good. My corn was tilted a little though. It bounced back quickly thanks to the beans winding around it acting like a stabilizer. I gave up tossing and turning in favor of checking over things. The lounge chair cushions will take days to dry out. 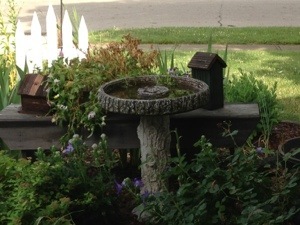 But now I am curled up on my porch with another project. Not that I don’t have a ton to finish. It just felt like a fresh-start moment. The sun is trying to peek through now and if its nicer this afternoon me (and my knitting) will take the kids to the pool. Happy …what day is it? Wednesday?… Happy Wednesday! 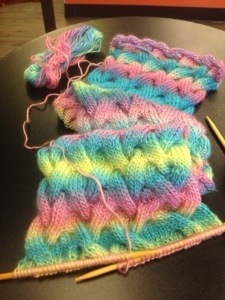 This entry was posted in day to day and tagged coffee, Knitting, mornings on June 26, 2013 by jennyinstitches.